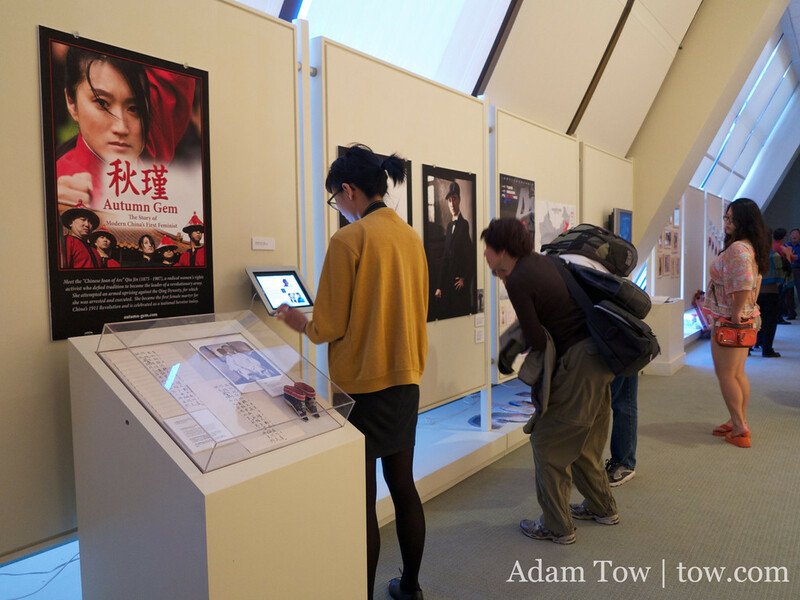 WOMEN我們 Exhibit Opening Reception a Success! The WOMEN我們 Exhibit Opening Reception at the Chinese Culture Center on Saturday was a lively success! We had a fantastic turnout with many viewers attending the artists panel moderated by CCC Executive Director Mabel Teng. The panel was a great opportunity to dialogue with the audience regarding the exploration of gender issues in our work, attitudes towards feminism (whether one identifies as such or not), and the contemporary women’s movement in China. We had a wonderful time interacting with audience members and getting their thoughts on our work. Interestingly, the exhibit also attracted a large contingent of people gathered outside who were participating in a rally protesting the Japanese takeover of a group of islands also claimed by China (a very contentious issue amongst Chinese at home and abroad). It was fascinating to hear the wide range of reactions to issues addressed in the exhibit, including gender transgressions, LGBTQ identities, and sexual discrimination from these viewers who came upon the show by chance. The day before the opening, we attended a press event at the gallery and participated in a group dialogue with Professor Lenore Metrick-Chen, an Art and Cultural Historian from Drake University in Iowa. The exhibit was also featured in a news segment on KTSF Channel 26, a local TV station serving the Asian community. Our AUTUMN GEM posters are featured in the opening shots of the segment – check out the video clip below! It was great meeting the other artists for the first time and seeing the threads connecting our work. Engaging with them was an eye-opening and enlightening experience, and definitely gave us a new perspective on our own project. The WOMEN我們 Exhibit runs through November 30, 2012, so be sure to check it out and invite your friends. Click on the link below to view the news segment and photos from the opening reception!